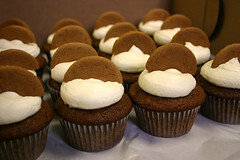 Gingerbread cupcakes with vanilla buttercream topped with a ginger snap from Dozen Cupcakes in Pittsburgh. These are the greatest looking cupcakes I have seen in a long time! Hope they open in time for my event!